The market has digested 3 big USDA numbers in the last month and appears to be standing. CBOT markets have been like Rocky vs the Russian in Rocky IV where it has taken shot after shot of bearish data over the last month and is still hanging in. While the fight remains heavilly in favor of the bears, the bearish data from yesterday resulted in covering post report. In the Cotton markets, the opposite has occurred (kind of, bearish acreage data). 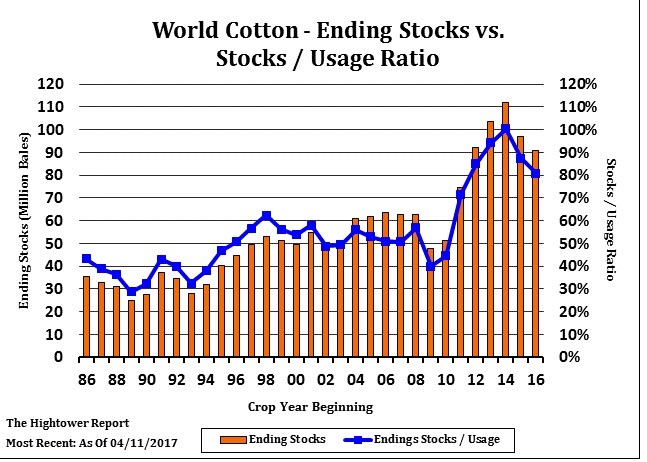 Cotton saw the increases in demand that we all expected via an 800,000 bale export jump. Stocks to use fell but the market sold off. The whole trade feels like one big covering event may be occurring as the funds square up ahead of the next fight, the US growing season. I think wheat shorts will begin to peel out, reversing some of the spread action that has taken HRW/MinnyW down vs the CME Chicago contract. I would look to buy July KC Wheat vs July Chicago wheat at 3 cents on a stop. Right now the spread is at 5 cents, you could get 2 better but I would rather wait and see if the spread widens or jumps back over the last support level. If you have use the DT Pro platform and can do OCO orders, look to put an order in to buy at 7-4 on a limit to the CME side and the stop order at 3. If one gets taken out the platform will cancel the other. If you work with me personally, I can do execute it that way if you wish. Buy July corn at 373 with a stop on close below 360. The MACD is rolling over and according to Cullen, that is good. 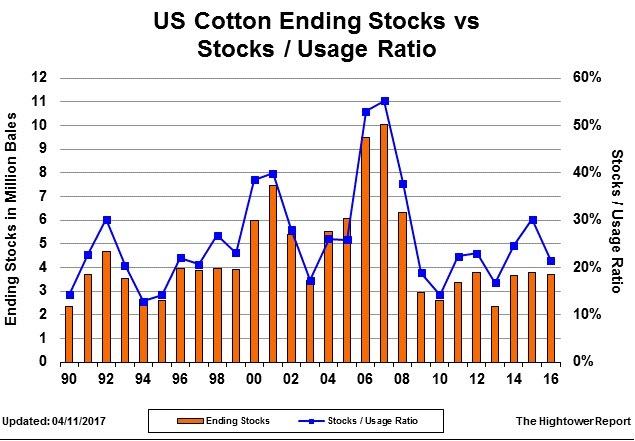 COTTON: The lower close after the bullish number is worth noting. Trend followers are probably looking to get short ahead of planting with the hopes of getting long again at lower prices. The report was very bullish, we saw the carryout fall from 4.5 million bales to 3.7 million bales. Thats a heck of a cut. We are now below last years numbers. It is really a new crop story vs an old crop story at this point, and until we get into the bulk of the growing season (planting is still a few weeks away in earnest). The world numbers are not so tight with ending stocks raised .5 million bales from 90.48 due to higher exports from India. If you shorted yesterday at 73.50, trail the stop down if we break the recent lows near 72.50. SOYBEANS: There was little bullish about the US soybean report. We saw global production raised and US demand held steady. We saw Chinese imports raised but the hikes from SAM will eat all of that gain up for now. We got very typical “sell the rumor buy the fact” type of action which was expected. One of the rules that has worked in recent history was to not get too oversold beans in February. Bears have gotten away with it thus far but I have a feeling we see that 1030 nov level again at some point. If you have hedged there, I would look to get some of it back. It is never that easy, especially in soybeans. Production hikes continue but you can expect demand increases as well. The double edge sword to having so many bean acres is that if we lose production and do a 45 bpa, that is almost 300 million bushels off trend which can erase the forward carryout quickly. And even though prices are cheap here, they are cheaper in Brazil, especially in Real terms. I think producers hold there for higher prices and make the market work. On a side note, US leaders are softening on the Chinese as currency manipulators. I wouldn’t be shocked to see China reward us in this quarter with some solid ag purchases. Take a look at this image of what Chinese demand if soy represents to the world markets. WHEAT: It is the same story in wheat as it has been in past reports. Massive supplies globally, both in the hands of users and exporters. As weird as it sounds, it feels like wheat could take a lead here as we get into the critical time for wheat weather. US weather is showing more moisture in KCW regions, and dryness overseas in Europe. 5.00 wheat is still cheap relative to the last decade. 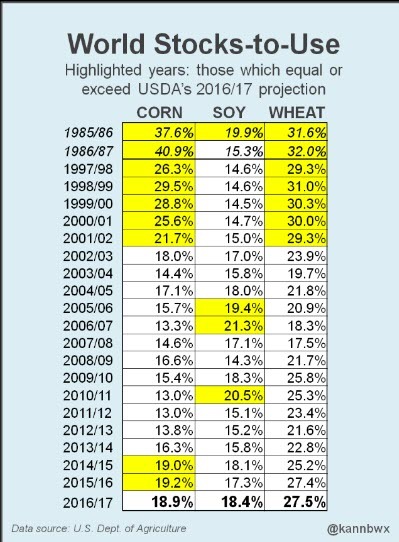 I expect we will see a run at some point in wheat prices back to recent highs. If the COT reports show the specs getting long, we will look to sell it. USE THE CARRY. Find out if you can HTA wheat in deferred contracts if you have on farm storage. If you can hold wheat to next March, you could see KC trade into the mid-high 5’s. CORN: Corn production in Argentina was raised 1 MMT while Brazil production was raised above 93 MMT. It is still really early given the rains in Argentina and the lack of rain in Brazil, but things feel solid none the less. Massive supplies have been well documented, but the thesis through summer/early fall is that competition for feed grain demand will be rising. Take a look at the markets that use corn. Ethanol- 3 month highs. Livestock – Cattle 6 month highs and hogs making a push toward highs. Exports- US exports are 66% higher than a year ago. Now is not the time to be bearish. While I don’t feel we have a ton of upside in the near term thanks to a huge on farm position, I wouldn’t be shocked to see the carries tighten up a bit especially ahead of the crop growing season. I expect May corn could make a run to 375 before delivery, but I would move it there if you are up against the time wall. Globally, the supply story is big, but stocks to use is actually lower than a year ago. July corn sits right at its 100 day MA’s, with the 200 day target near 383 in play. The July 2017 contract has traded above its 200 day MA for three weeks over the life on the contract. With a massive short position on the books, I think we give it a run here.